Surgical patients undergoing general anesthesia have been extensively studied; fatal pulmonary embolism (PE) rates range from 0.1% to 0.8% for all patients [1, 2] and may be as high as 7% for patients undergoing surgery for fractured hips. Many different forms of therapy have been evaluated in this group. Studies of pneumatic compression in cardiac surgery and neurosurgical patients have shown a distinct improvement in the incidence of deep venous thrombosis (DVT) without the added risk of bleeding. [4, 5] However, the effect is less impressive in higher-risk patients, and compliance can be difficult. For more information, see Deep Venous Thrombosis and Pulmonary Embolism. In a study of the efficacy of IPC in multiple postoperative patient groups versus no use of prophylaxis, Urbankova et al reported that the incidence of DVT was reduced by 60%. However, the use of mechanical means of prophylaxis alone is not effective in moderate or high-risk cases. Patient compliance is an issue with IPC devices, and the efficacy is dependent on the time of use. Evidence from clinical trials has also shown that although the rate of distal thrombi is reduced significantly, proximal thrombi are not. This finding may lead to a false sense of security because although the total number of deep venous thrombi may be similar to the numbers observed with pharmacologic prophylaxis, the proportion of the relatively more dangerous proximal clots is increased (see Table 1 below). Although all three types of mechanical compression reduce the incidence of DVT to less than that found when prophylaxis is absent, these modalities are generally less effective at producing such reductions than are pharmacologic methods. Shorter lengths of hospital stays make the use of mechanical methods alone ineffective in preventing DVT in the critical weeks after joint replacement. No mechanical prophylaxis method has been shown to reduce the risk of PE or death. The use of IPC devices is therefore recommended primarily as an adjunct to anticoagulant-based prophylaxis or in patients who are at high risk of bleeding. In a concomitant study of 4088 patients with THRs, a 25% reduction of DVT was observed in comparison with the placebo control, but no decrease was noted in the rate of pulmonary embolism. This trial did not show a clear benefit to using aspirin as the primary method of venous prophylaxis in patients undergoing either total hip or total knee surgery. The Seventh ACCP Conference did not recommend the use of aspirin alone as a prophylactic agent for any patient group, because aspirin is less effective than other options. However, reports by Lotke and Lonner  and by Berend and Lombardi  suggested that the use of aspirin combined with optimally used IPC devices may be effective in some circumstances in preventing fatal pulmonary embolism. Coumarins are a class of oral anticoagulant drugs, which act as antagonists to vitamin K. The mechanism of action is to interfere with the interaction between vitamin K and coagulation factors II, VII, IX, and X. Vitamin K acts as a cofactor at these levels. Coumarins produce their anticoagulant effect by inhibiting the carboxylation necessary for biologic activity. Warfarin is a mixture of two isomers, the R and S forms, in roughly equal proportions. This agent is absorbed rapidly from the gastrointestinal (GI) tract and bound to plasma proteins. Although it has high bioavailability, warfarin requires 36-72 hours to reach a stable loading dose. The dose response in patients taking warfarin is variable, and it is influenced by various genetic and environmental factors. In addition, numerous drug interactions and disease states may affect its pharmacokinetics. Warfarin, therefore, requires continuous laboratory monitoring. The effectiveness of warfarin anticoagulation is measured by determining the prothrombin time (PT) or protime against a standard control. The use of the international normalized ratio (INR) has supplanted the PT for hospital use. INR uses a standardized PT, which allows for comparisons between hospitals and laboratories. For DVT prophylaxis, the optimal INR is between 2 and 3, with a target of 2.5. When used for DVT prophylaxis after THR, warfarin reduces total DVT by 60% and proximal DVT by 70%. Disadvantages of warfarin use include its long onset of action, the necessity to monitor INR values frequently to obtain a stable dosage, the long half-life that may require vitamin K reversal in incidents of hemorrhage, frequent drug and dietary interaction, and variable patient response. Hemorrhagic complications are reported in up to 3-5% of patients on warfarin prophylaxis. If adjusted-dose warfarin is to be used, it is started the night before surgery and continued postoperatively during the discharge period. INR target levels are not usually reached until postoperative day 3. Standard unfractionated heparin (UFH) is recognized as an acceptable anticoagulant modality and has been used for this purpose in various forms since its discovery by McLean in 1916. 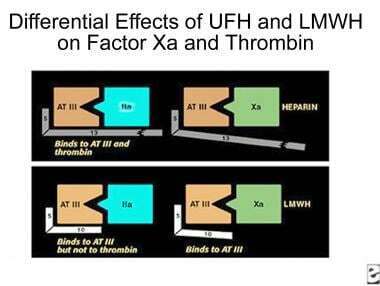 UFH acts in conjunction with a circulating plasma cofactor, antithrombin (AT) III and, in its presence, catalyzes the inactivation of factors IIa, Xa, IXa, and XIIa. By inactivating thrombin, heparin not only prevents fibrin formation but also inhibits thrombin-induced activation of factor V and factor VIII. Of these, factors IIa and Xa are most sensitive. Therefore, heparin has anticoagulant and antithrombotic properties. Heparin is a heterogeneous mixture of molecules that contain a range of molecular weights of 3-30 kd, with an average of approximately 15 kd. Only one third of the heparin molecules have an active binding site for ATIII, and this fraction is responsible for most of the anticoagulant activity. Heparin is effective when given by intravenous (IV) or subcutaneous (SC) administration but is inactivated in the GI tract. This agent has a rapid onset of action, its half-life is brief in comparison to warfarin, and it binds to platelets, endothelial cells, and macrophages in vivo. Therapeutic levels of heparin are measured by the activated partial thromboplastin time (aPTT). Because of the rapid clearance of heparin from the bloodstream, therapeutic levels (aPTT of 1.2-1.5 × control) are more likely achieved with continuous IV infusion. Postoperative DVT prophylaxis with UFH is usually achieved by administering a bolus of 5000 U every 8 hours. This low-dose heparin regimen results in a 60-70% reduction of DVT and PE in low-risk or moderate-risk patients. However, this method is not as effective in patients who are at high risk for development of DVT or PE. In these patients, adjusted-dose heparin with aPTT monitoring is preferred to maintain the desired anticoagulant level. Studies have demonstrated a high hemorrhagic complication rate of 8-15% when this method is used for postoperative DVT prophylaxis. Heparin overdosage is reversible with protamine sulfate, which itself is an anticoagulant. Each milligram of protamine sulfate can neutralize approximately 100 U of heparin activity. This agent must be administered very slowly by IV infusion over a 10-minute period in doses not to exceed 50 mg. Because heparin is rapidly cleared from the circulation, the amount of protamine required decreases rapidly as the time from initial heparin administration increases. The final dosage required is titrated according to coagulation studies. In addition, a small percentage of patients (2-4%) are susceptible to the development of heparin-induced thrombocytopenia (HIT), which is an antibody-mediated adverse reaction that can cause venous and arterial thrombosis. HIT is heralded by an otherwise unexpected fall in platelet count of greater than 50% from previous levels. HIT can result in disseminated intravascular coagulation (DIC) and gangrene in severe cases. Treatment with danaparoid sodium or recombinant hirudin, such as lepirudin, may be effective in life-threatening cases. A comparison study by McGarry et al of outcomes of thromboprophylaxis between an LMWH (enoxaparin) and UFH revealed a 74% lower incidence of VTE in the LMWH group. No significant difference in side effects, deaths in the hospital, or economics was noted. LMWHs are manufactured when standard heparin is treated by various enzymatic or chemical methods to select those lower-molecular-weight moieties that contain the active ATIII binding site. The average molecular weight of fractionated heparin is 4.5 kd rather than the usual 15 kd. The molecular-weight threshold under which anti-factor Xa activity is maximized is 5.4 kd. The polysaccharide side chain of the heparin molecule is decreased from 18 U to approximately 13 U. As the length of the side chain is decreased, the ability of the molecule to prolong the aPTT is lost, but the ability to complex with ATIII is retained. LMWHs do not require monitoring of either aPTT or INR (see the image below). Comparison of binding sites for standard heparin and low-molecular-weight heparin. The pharmacologic effect of this transformation is to make the LMWH more bioavailable (~90%, compared with 29% for UFH) and to lengthen its half-life to 4 hours from 1 hour for UFH. LMWH also increases the activity ratio of anti-Xa to anti-IIa, resulting in increased antithrombotic activity. Keeney and colleagues reported on the use of early mobilization with a combination of IPC and adjusted-dose short-duration warfarin in a group of patients undergoing 700 primary and revision total hip arthroplasties. The investigators recorded a low incidence of clinical DVT (as measured by ultrasonography) on postoperative day 3 or 4 and of clinical DVT and PE within 90 days postoperatively. Further clinical investigations with larger numbers of patients are necessary to determine the optimal levels and duration of anticoagulation with the appropriate risk/benefit ratio. Rivaroxaban was compared with enoxaparin for acute DVT. Efficacy showed noninferiority to enoxaparin for short-term use. When used as continued treatment, rivaroxaban had superior efficacy (P< .001) compared with placebo. A study comparing rivaroxaban to warfarin for long-term efficacy is warranted. Rivaroxaban was found to be equivalent to enoxaparin/vitamin K antagonist in the treatment of established DVT, also without an increase in bleeding complications. In November 2015, the FDA approved dabigatran for prophylaxis of DVT and PE after hip replacement surgery. Approval was based on the RE-NOVATE and RE-NOVATE II trials. [41, 42] Dabigatran was found to have similar effectiveness and safety in preventing VTE following hip arthroplasty as compared with enoxaparin. In separate studies, Rosendaal, Kearon, and Bulger et al analyzed the relative contribution of individual risk factors to the development of DVT. [43, 44, 45] When more than one risk factor is present, the risk is cumulative; however, no good model suggests how the individual risk factors interact. Nonetheless, several attempts have been made to quantify the risk factors associated with VTE. The use of a checklist to stratify patients and assign them to categories of relative propensity for DVT development is helpful in deciding on an appropriate treatment regimen (see below). A list can be constructed by using the ACCP risk categories. These figures include a list of the pertinent factors, which are arbitrarily assigned a risk level between 1 and 5. An individual aged 61-75 years is assigned 2 units; a person older than 75 years is assigned a score of 3, as is an individual with a previous history of thrombosis, inherited thrombophilia, antiphospholipid antibodies, or lupusanticoagulant.The total score is then added. Risk factors are grouped according to severity and are added to produce an overall risk factor score, which corresponds to a low through a very high potential for DVT development. These factors include those that diminish venous flow or return, increase viscosity, or alter mobility. Age is one of the most easily definable factors. The risk of DVT increases in exponential fashion with increasing age (see the image below). By using the risk criteria listed above, orthopedic patients can be categorized into four risk groups, ranging from low to very high (see Table 2 below). Appropriate methods of prophylaxis may be applied to each level. Low-risk patients have a score of 1 or less. These are individuals who are younger than 40 years who are undergoing a minor surgical procedure and have no additional risk factors. The risk of calf DVT in this group is estimated to be 2-5% without prophylaxis, and the risk of clinical pulmonary thrombosis is 0.2% No specific prophylaxis is required in this group other than early and aggressive mobilization. Moderate-risk patients have a score of 2 or less. They are individuals in the above group who have additional risk factors or are aged 40-60 years who are undergoing nonmajor surgery and have no additional risk factors. Other risk factors are surgery requiring a tourniquet (eg, arthroscopy), lower-extremity fractures, cast immobilization, or spinal surgery. Major surgery in patients younger than 40 years poses a moderate risk of DVT, which is estimated at 10-20%. The risk of clinical PE in this group is 1-2%. Successful prevention strategies in this group consist of low-dose UFH (LDUH; q12hr), LMWH (< 3400 U q24hr), and GCS or IPC. High-risk patients have a score of 3 or 4 and include persons older than 60 years, as well as patients aged 40-60 years who have additional risk factors, such as previous VTE, malignancy, or hypercoagulability. The risk of calf DVT is estimated at 20-40% in this group, with clinical pulmonary embolism occurring in 2-4%. Successful prevention strategies in this group consist of LDUH (q8hr) and LMWH (>3400 U q24hr), with or without IPC. The highest-risk patients have a score of 5 or greater; they are older than 40 years who have additional risk factors, who are undergoing hip or knee replacement surgery, or who have had hip fracture, open lower-leg fracture, multiple trauma, or spinal cord injury. Hip fracture patients have the highest risk of dying from a fatal PE. Additional risk factors may include a history of VTE, malignancy, or hypercoagulable state. These factors carry an estimated risk of calf DVT of 40-80% without prophylaxis, with clinical PE occurring in 4-10% and fatal PE in 0.2-5%. Successful prevention strategies include LMWH (>3400 U q24hr), fondaparinux, and coumarins (INR 2-3). Dose-adjusted LDUH or LMWH may be used with or without IPC/GCS. To see complete information on Deep Venous Thrombosis Risk Stratification, please go to the main article by clicking here. For patients who have no additional risk factors, antithrombotic prophylaxis following elective spine surgery is not recommended. Patients at high risk for developing postoperative VTE may be treated with LDUH, LMWH, or perioperative IPC. Multiple risk factors may require the combined use of mechanical and pharmacologic measures. Anticoagulant prophylaxis should be used with caution in patients receiving spinal or indwelling catheter epidural anesthesia. Although the risk of spinal hematoma is very small (0.0025% with spinal anesthesia and 0.03% with epidural anesthesia), care should be taken to delay the initiation of thromboprophylaxis for at least 2 hours after catheter removal. Patients with known bleeding disorders should not receive preoperative prophylaxis if they are to receive spinal anesthesia. In cases of traumatic spinal tap with bloody spinal fluid, postoperative administration of thromboprophylaxis should be done with caution. In Europe, it is common practice to begin anticoagulant prophylaxis 10-12 hours before surgery. In North America, the practice is to begin treatment 12-24 hours following surgery. The ninth edition of the ACCP guidelines suggested that for most major elective orthopedic surgical procedures, the first dose of LMWH may be administered either before or after surgery,  though meta-analyses suggest little advantage for preoperative initiation. For additional information, see Deep Venous Thrombosis, and Pulmonary Embolism. An ideal anticoagulant should be easy to administer (preferably oral), should be effective and safe with a minimum of possible complications or adverse effects, have a rapid onset, have a therapeutic half-life, and require minimal or no monitoring. The action of the anticoagulant should be predictable with few drug or dietary interactions, and it should be reversible. The drug should also be inexpensive. Unfortunately, these criteria are often difficult to achieve. Several anticoagulant agents exist today, and each of them incorporates some of these characteristics, but no single agent combines all these attributes. Current research in anticoagulants involves investigations into drugs that act on various phases of the coagulation cascade. For convenience, the authors can arbitrarily divide the process into three phases: the initiation phase, the propagation phase, and the thrombin activity phase. Drugs under investigation that act in the initiation phase include tissue factor pathway inhibitors (TFPIs) and nematode anticoagulant peptide (NAPc2). These drugs act through inhibition of the factor VIIa/tissue factor complex. Ximelagatran, a direct thrombin inhibitor consisting of an oral prodrug of melagatran, is rapidly absorbed through the GI tract, where it is converted to its active form, melagatran. It does not require monitoring, as it has a rapid onset of action, a predictable dose-response, and a therapeutic half-life. Also, like the other direct thrombin inhibitors, it does not affect the aPTT or PT. The results reported by Francis et al in the New England Journal of Medicine showed that ximelagatran and warfarin did not differ significantly with respect to the incidence of major or minor bleeding. The report also determined that ximelagatran was significantly more effective in preventing DVT after TKR than was warfarin. Drugs that act on the third stage of the coagulation cascade, the thrombin activity phase, include the direct thrombin inhibitors. These drugs specifically inactivate thrombin and are independent of ATII). Included in this group are the hirudins and their derivatives made by recombinant DNA techniques. Originally, hirudin was isolated from leech salivary gland tissue. The new drugs include bivalirudin and lepirudin. 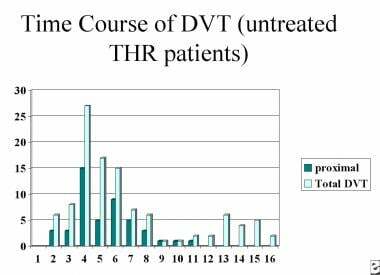 A randomized, multicenter, double-blind study of hirudin versus heparin in patients with THRs demonstrated that DVT and proximal DVT rates were decreased substantially in the hirudin group. Another class of drugs acting at the third level of the coagulation cascade includes the noncovalent inhibitor argatroban, which is a carboxylic acid derivative that has been approved for use in the treatment of HIT. Major surgical and high-risk orthopedic procedures place patients at risk for DVT and VTE, including PE. Complications of DVT include postphlebitic syndrome or death from PE. Therefore, prophylaxis with anticoagulant medications, as well as the adjunctive use of mechanical devices, is essential. The most effective treatment protocol for a patient must be determined on a case-by-case basis and account for the risk-benefit ratio in each situation. A risk stratification protocol, such as that developed by the ACCP, is recommended to determine the appropriate level and method of treatment. Preventing VTE is always a tradeoff between the potential life-saving benefit of prophylaxis and the risk of hemorrhage. Therefore, even with adequate anticoagulant prophylaxis, DVT can and does develop. A study by Schiff et al revealed a 14% incidence of VTE following major orthopedic procedures, particularly TKR, in which standard prophylactic measures had been applied. Continued vigilance and a high index of suspicion on the part of the medical staff is called for in this group of patients. For fuller information on DVT and PE, please see Deep Venous Thrombosis and Pulmonary Embolism. Why is venous thrombosis prophylaxis needed for patients undergoing orthopedic surgery? Which mechanical methods are used for deep venous thrombosis (DVT) prophylaxis in patients undergoing orthopedic surgery? Which pharmacologic methods of deep venous thrombosis (DVT) prophylaxis are used in orthopedic surgery? What is the role of platelet-active drugs in deep venous thrombosis (DVT) prophylaxis for patients undergoing orthopedic surgery? What is the role of coumarins in deep venous thrombosis (DVT) prophylaxis for patients undergoing orthopedic surgery? What is the role of heparins in deep venous thrombosis (DVT) prophylaxis for patients undergoing orthopedic surgery for patients undergoing orthopedic surgery? What are the disadvantages of unfractionated heparin (UFH) for deep venous thrombosis (DVT) prophylaxis in patients undergoing orthopedic surgery? What is the role of low-molecular-weight heparins (LMWH) in deep venous thrombosis (DVT) prophylaxis for patients undergoing orthopedic surgery? What is the role of fondaparinux sodium in deep venous thrombosis (DVT) prophylaxis for patients undergoing orthopedic surgery? Which combination therapies have been used for deep venous thrombosis (DVT) prophylaxis in patients undergoing orthopedic surgery? What is the role of factor XA inhibitors in deep venous thrombosis (DVT) prophylaxis for patients undergoing orthopedic surgery? What is the role of direct thrombin inhibitors in deep venous thrombosis (DVT) prophylaxis for patients undergoing orthopedic surgery? What is the role of risk stratification in deep venous thrombosis (DVT) prophylaxis for patients undergoing orthopedic surgery? How is deep venous thrombosis (DVT) risk determined prior to orthopedic surgery? What is the variation of risk in patients undergoing deep venous thrombosis (DVT) prophylaxis? What are the ESA guidelines for prophylaxis for venous thromboembolism (VTE) in elderly persons undergoing surgery? What are the ACCP guidelines for deep venous thrombosis (DVT) prophylaxis in patients undergoing orthopedic surgery? What is the role of deep venous thrombosis (DVT) prophylaxis in elective spine surgery? What are risk factors for deep venous thrombosis (DVT) prophylaxis in patients undergoing spinal or epidural anesthesia? How long prior to orthopedic surgery should deep venous thrombosis (DVT) prophylaxis be initiated? What are the criteria for deep venous thrombosis (DVT) prophylaxis prior to orthopedic surgery? Which drugs are under investigation for deep venous thrombosis (DVT) prophylaxis prior to orthopedic surgery? What is the role of ximelagatran in deep venous thrombosis (DVT) prophylaxis prior to orthopedic surgery? What is the role of direct thrombin inhibitors in deep venous thrombosis (DVT) prophylaxis prior to orthopedic surgery? What is the role of argatroban in deep venous thrombosis (DVT) prophylaxis prior to orthopedic surgery? How is the treatment protocol for deep venous thrombosis (DVT) prophylaxis determined prior to orthopedic surgery? What is the prevalence of deep venous thrombosis (DVT) following orthopedic surgery? Eskeland G, Solheim K, Skjörten F. Anticoagulant prophylaxis, thromboembolism and mortality in elderly patients with hip fractures. A controlled clinical trial. Acta Chir Scand. 1966 Jan-Feb. 131(1):16-29. [Medline]. Skillman JJ, Collins RE, Coe NP, Goldstein BS, Shapiro RM, Zervas NT, et al. Prevention of deep vein thrombosis in neurosurgical patients: a controlled, randomized trial of external pneumatic compression boots. Surgery. 1978 Mar. 83(3):354-8. [Medline]. Hull RD, Pineo GF, Stein PD, Mah AF, MacIsaac SM, Dahl OE, et al. Timing of initial administration of low-molecular-weight heparin prophylaxis against deep vein thrombosis in patients following elective hip arthroplasty: a systematic review. Arch Intern Med. 2001 Sep 10. 161(16):1952-60. [Medline]. [Guideline] Falck-Ytter Y, Francis CW, Johanson NA, Curley C, Dahl OE, Schulman S, et al. Prevention of VTE in orthopedic surgery patients: Antithrombotic Therapy and Prevention of Thrombosis, 9th ed: American College of Chest Physicians Evidence-Based Clinical Practice Guidelines. Chest. 2012 Feb. 141 (2 Suppl):e278S-325S. [Medline]. [Guideline] Kearon C, Akl EA, Ornelas J, Blaivas A, Jimenez D, Bounameaux H, et al. Antithrombotic Therapy for VTE Disease: CHEST Guideline and Expert Panel Report. Chest. 2016 Feb. 149 (2):315-352. [Medline]. [Full Text]. Patel N, Khakha R, Gibbs J. Review Article: Anti-embolism stockings. J Orthop Surg (Hong Kong). 2013 Dec. 21(3):361-4. [Medline]. Camporese G, Bernardi E, Prandoni P, Noventa F, Verlato F, Simioni P, et al. Low-molecular-weight heparin versus compression stockings for thromboprophylaxis after knee arthroscopy: a randomized trial. Ann Intern Med. 2008 Jul 15. 149(2):73-82. [Medline]. Sajid MS, Desai M, Morris RW, Hamilton G. Knee length versus thigh length graduated compression stockings for prevention of deep vein thrombosis in postoperative surgical patients. Cochrane Database Syst Rev. 2012 May 16. 5:CD007162. [Medline]. Urbankova J, Quiroz R, Kucher N, Goldhaber SZ. Intermittent pneumatic compression and deep vein thrombosis prevention. A meta-analysis in postoperative patients. Thromb Haemost. 2005 Dec. 94(6):1181-5. [Medline]. McGarry LJ, Stokes ME, Thompson D. Outcomes of thromboprophylaxis with enoxaparin vs. unfractionated heparin in medical inpatients. Thromb J. 2006 Sep 27. 4:17. [Medline]. [Full Text]. Hull RD, Pineo GF, Francis C, Bergqvist D, Fellenius C, Soderberg K, et al. Low-molecular-weight heparin prophylaxis using dalteparin extended out-of-hospital vs in-hospital warfarin/out-of-hospital placebo in hip arthroplasty patients: a double-blind, randomized comparison. North American Fragmin Trial Investigators. Arch Intern Med. 2000 Jul 24. 160(14):2208-15. [Medline]. Mahmoudi M, Sobieraj DM. The cost-effectiveness of oral direct factor xa inhibitors compared with low-molecular-weight heparin for the prevention of venous thromboembolism prophylaxis in total hip or knee replacement surgery. Pharmacotherapy. 2013 Dec. 33(12):1333-40. [Medline]. Turpie AG, Lassen MR, Davidson BL, Bauer KA, Gent M, Kwong LM, et al. Rivaroxaban versus enoxaparin for thromboprophylaxis after total knee arthroplasty (RECORD4): a randomised trial. Lancet. 2009 May 16. 373(9676):1673-80. [Medline]. Eriksson BI, Borris LC, Friedman RJ, Haas S, Huisman MV, Kakkar AK, et al. Rivaroxaban versus enoxaparin for thromboprophylaxis after hip arthroplasty. N Engl J Med. 2008 Jun 26. 358(26):2765-75. [Medline]. Lassen MR, Ageno W, Borris LC, Lieberman JR, Rosencher N, Bandel TJ, et al. Rivaroxaban versus enoxaparin for thromboprophylaxis after total knee arthroplasty. N Engl J Med. 2008 Jun 26. 358(26):2776-86. [Medline]. Kakkar AK, Brenner B, Dahl OE, Eriksson BI, Mouret P, Muntz J, et al. Extended duration rivaroxaban versus short-term enoxaparin for the prevention of venous thromboembolism after total hip arthroplasty: a double-blind, randomised controlled trial. Lancet. 2008 Jul 5. 372(9632):31-9. [Medline]. Degirmenci SE, Steib A. [New direct oral anticoagulants and venous thromboprophylaxis]. Rev Prat. 2013 Sep. 63(7):976-9. [Medline]. Kwong LM. Comparative safety and efficacy of antithrombotics in the management of venous thromboembolism after knee or hip replacement surgery: focus on rivaroxaban. Clin Pharmacol. 2013. 5:143-8. [Medline]. [Full Text]. EINSTEIN Investigators., Bauersachs R, Berkowitz SD, Brenner B, Buller HR, Decousus H, et al. Oral rivaroxaban for symptomatic venous thromboembolism. N Engl J Med. 2010 Dec 23. 363 (26):2499-510. [Medline]. [Full Text]. Lassen MR, Gallus A, Raskob GE, Pineo G, Chen D, Ramirez LM. Apixaban versus enoxaparin for thromboprophylaxis after hip replacement. N Engl J Med. 2010 Dec 23. 363(26):2487-98. [Medline]. Eriksson BI, Dahl OE, Rosencher N, Kurth AA, van Dijk CN, Frostick SP, et al. Dabigatran etexilate versus enoxaparin for prevention of venous thromboembolism after total hip replacement: a randomised, double-blind, non-inferiority trial. Lancet. 2007 Sep 15. 370 (9591):949-56. [Medline]. Eriksson BI, Dahl OE, Huo MH, Kurth AA, Hantel S, Hermansson K, et al. Oral dabigatran versus enoxaparin for thromboprophylaxis after primary total hip arthroplasty (RE-NOVATE II*). A randomised, double-blind, non-inferiority trial. Thromb Haemost. 2011 Apr. 105 (4):721-9. [Medline]. Geerts WH, Heit JA, Clagett GP, Pineo GF, Colwell CW, Anderson FA Jr, et al. Prevention of venous thromboembolism. Chest. 2001 Jan. 119(1 Suppl):132S-175S. [Medline]. [Guideline] Kearon C, Kahn SR, Agnelli G, Goldhaber S, Raskob GE, Comerota AJ, et al. Antithrombotic therapy for venous thromboembolic disease: American College of Chest Physicians Evidence-Based Clinical Practice Guidelines (8th Edition). Chest. 2008 Jun. 133 (6 Suppl):454S-545S. [Medline]. [Guideline] Kozek-Langenecker S, Fenger-Eriksen C, Thienpont E, Barauskas G, ESA VTE Guidelines Task Force. European guidelines on perioperative venous thromboembolism prophylaxis: Surgery in the elderly. Eur J Anaesthesiol. 2018 Feb. 35 (2):116-122. [Medline]. Bergqvist D, Hull RD. Effective thromboprophytaxis administered close to the time of major orthopedic surgery: a review. Am J Orthop (Belle Mead NJ). 2006 May. 35(5):226-30. [Medline]. Francis CW, Berkowitz SD, Comp PC, Lieberman JR, Ginsberg JS, Paiement G, et al. Comparison of ximelagatran with warfarin for the prevention of venous thromboembolism after total knee replacement. N Engl J Med. 2003 Oct 30. 349(18):1703-12. [Medline]. Comp PC, Spiro TE, Friedman RJ, Whitsett TL, Johnson GJ, Gardiner GA Jr, et al. Prolonged enoxaparin therapy to prevent venous thromboembolism after primary hip or knee replacement. Enoxaparin Clinical Trial Group. J Bone Joint Surg Am. 2001 Mar. 83-A(3):336-45. [Medline]. Izumi M, Ikeuchi M, Aso K, Sugimura N, Kamimoto Y, Mitani T, et al. Less deep vein thrombosis due to transcutaneous fibular nerve stimulation in total knee arthroplasty: a randomized controlled trial. Knee Surg Sports Traumatol Arthrosc. 2015 Nov. 23 (11):3317-23. [Medline]. Schiff RL, Kahn SR, Shrier I, Strulovitch C, Hammouda W, Cohen E, et al. Identifying orthopedic patients at high risk for venous thromboembolism despite thromboprophylaxis. Chest. 2005 Nov. 128(5):3364-71. [Medline].